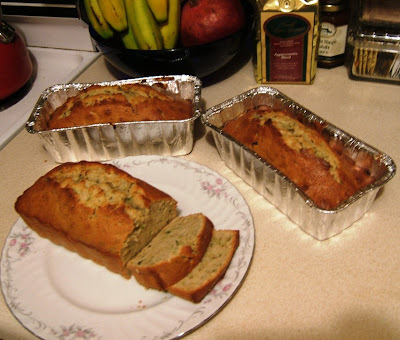 Since yesterday's Banana bread was such a success we decided to make Zucchini bread today. This recipe made 3 loaves. You could easily add nuts or chocolate chips, they would both be good additions. Mix ingredients together - in order! Bake at 350 degrees, 50-55 minutes. That does sound good! Very similar to the recipe in the family cookbook. Do you have a copy of the cookbook? I know Katie was working on making a copy for Brandon.........we'll get one to you too if you don't have one! I do have a copy, it is on a long old fashioned print out, but if there is an electronic version that could be emailed to me? That would be awesome! I may be able to do that. I'll see if I can locate the disk. Also, I think we have all added recipes along the way. We should do an update!! Hi This is Jennifer Walker one of Nana's girls. I am the oldest. The 12 yr. old. Um i wanted to know of Darian had an E-mail. I wanna get to know her too. I love animes like her and I enjoy reading,writeing,history, science, and drawing.Hope i can get to know her. P.S I also LOVE Poetry! I am the girl who wrote the poem Forrgotten Angel that I wanted you to tell me if you liked it.